Usually once a week I make dinner for my entire family. It is almost the only time we come together and sit down as a group. I think family dinners are an amazing thing and I always love sitting down with my family, hearing my siblings stories, and spending some time with my parents. We are all so busy that sometimes it seems like we barely see each other. When I am only making dinner for myself usually it is something quick and easy because I just do not have any time to spend in the kitchen after getting home from work. However, on days I am making dinner for my family I try to make a meal that is a little more special and to me that means the meal needs to wrap up with a dessert. Last week I knew I would not have the time need for baking something so I needed an easy dessert with no baking required. Also, since it seems like fall is close by I wanted to serve something that celebrated summer. 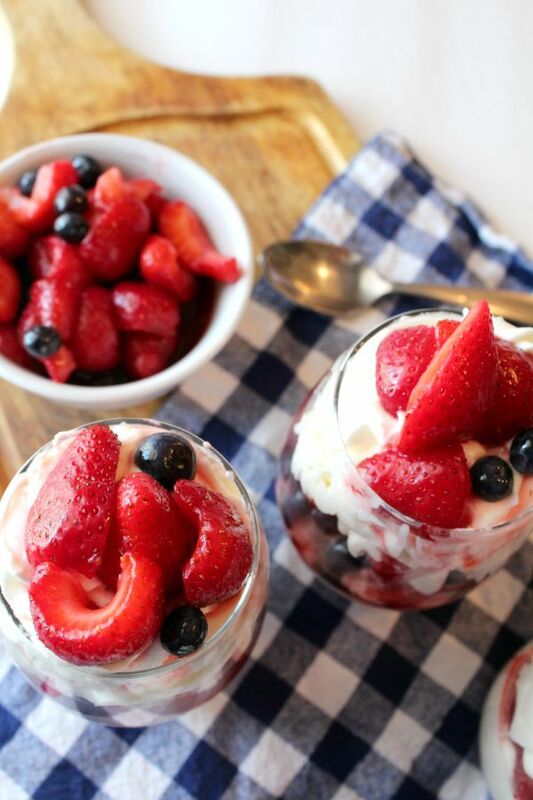 That is when the idea for these pretty little lemon berry parfaits came to me. 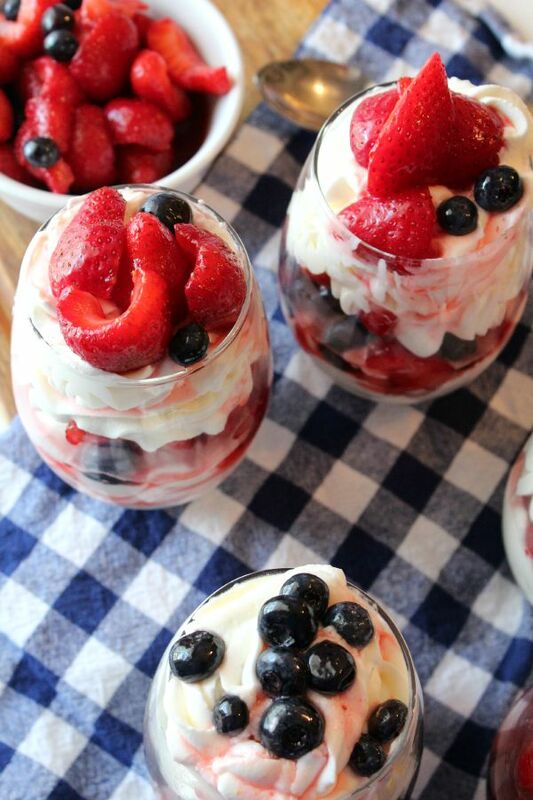 The recipe could not be simpler, the flavors are fresh and bright, and these parfaits are so pretty. You can use whatever combination of berries you like although I do think some strawberries are required for producing the delicious sauce. I stuck to a combination of strawberries and blueberries because they are my favorites. 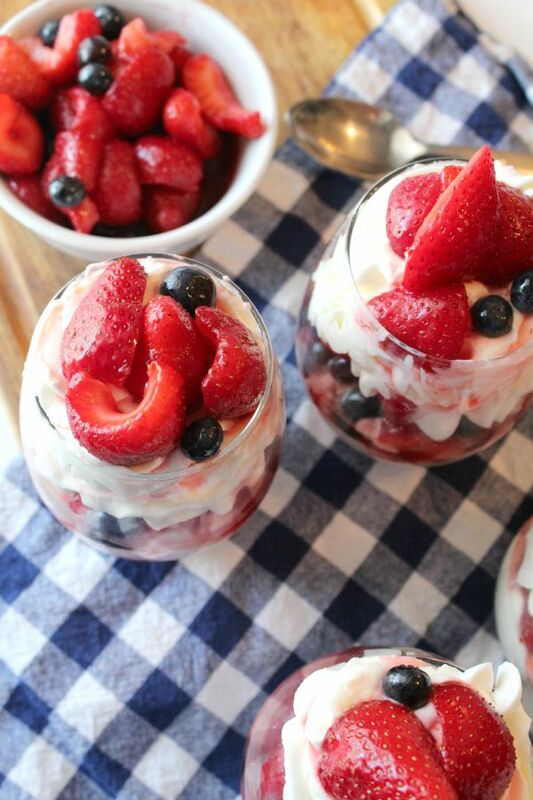 These little parfaits were a hit. Even my dad loved them and he is notorious picky about desserts. 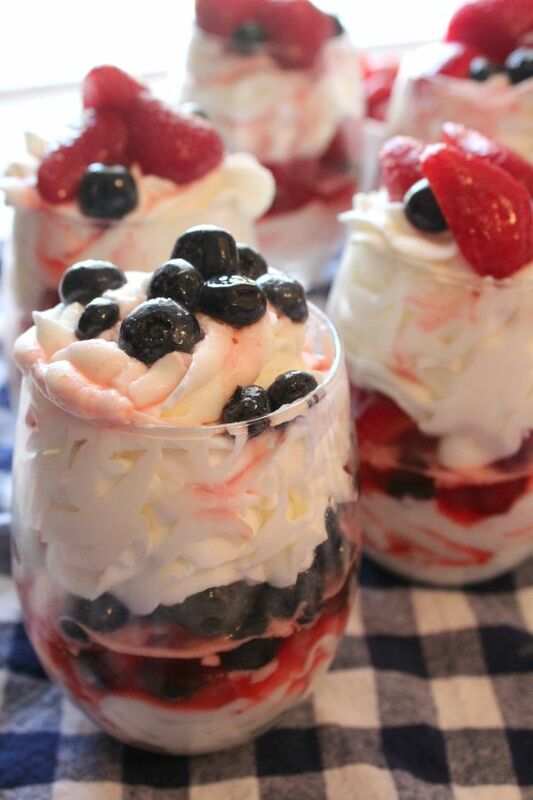 If you have any parfaits left over keep them covered in the refrigerator to enjoy over the next couple days. 1. Wash and dry your berries. Cut your strawberries into quarters. Toss the berries with the sugar. Mash a couple of the berries with the back of your spoon. Cover and let set at room temperature for 1 hour. This allows the berries to macerate. 2. 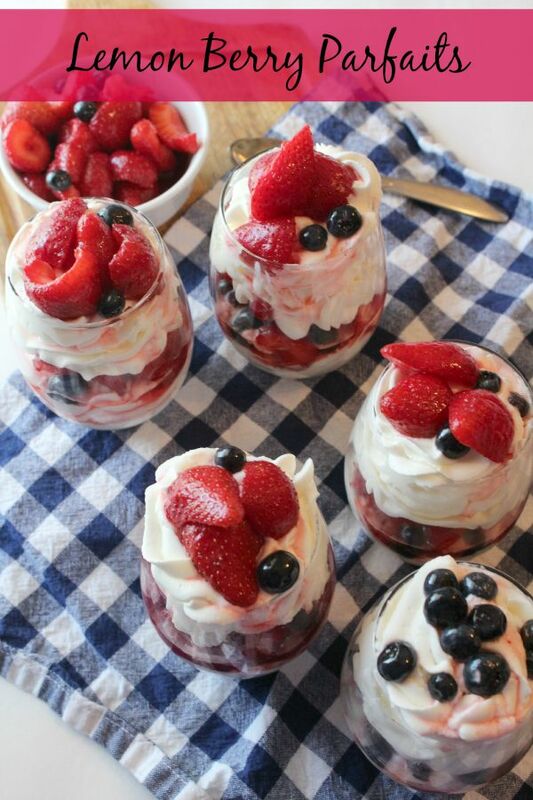 When berries are ready make your lemon whip topping. Chill your bowl and whip attachment for your mixer in the freezer for 5 minutes. 3. Pour cream into bowl and whip until peaks begin to form. Then slowly add your confectioner's sugar. 4. Once confectioner's sugar is incorporated added the zest of two lemons, lemon extract, and juice from lemons. The amount of juice you add is based upon how strong you want the lemon flavor to be. I find that 2 lemons provide a enough juice for the flavor I like. 5. Place whipped topping into a piping bag with a large star tip. Pipe some of the cream into the bottom of the individual glasses. 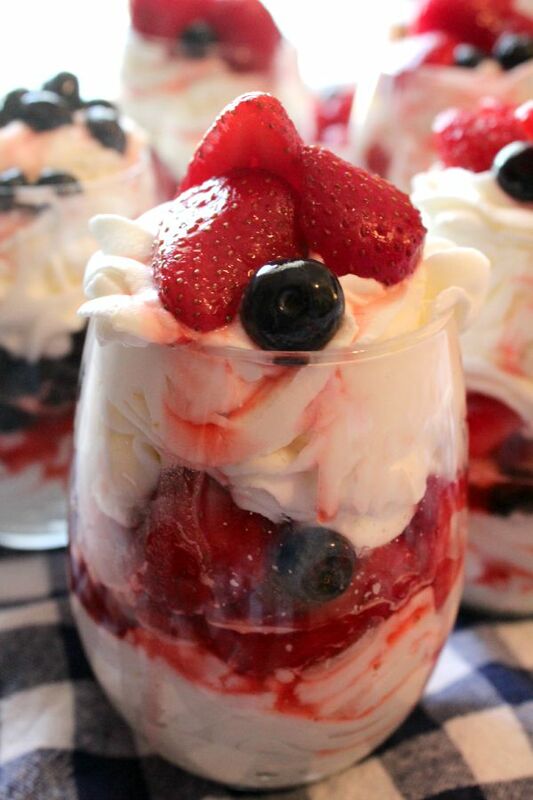 Top with some of the macerated berries and then fill the remainder of the glasses with whipped topping. Garnish the top with a few more berries. 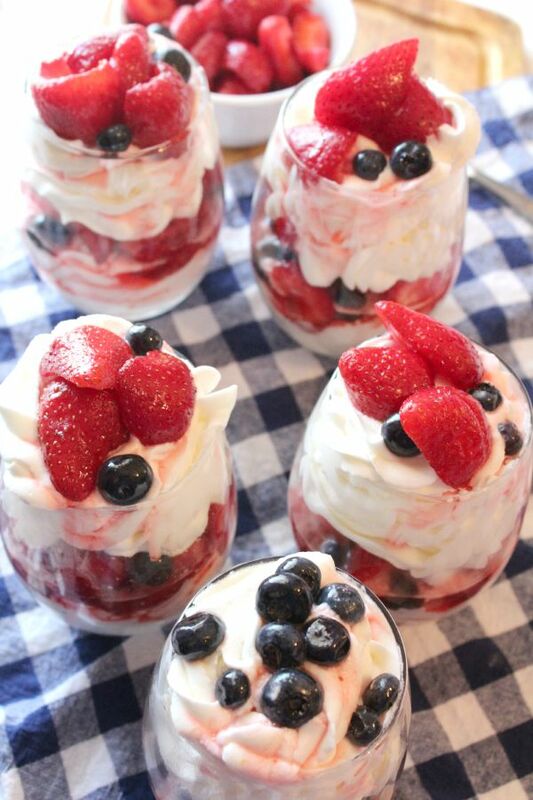 Yum, I love the addition of lemon to these parfaits.